UPDATE: I posted the rig over here! 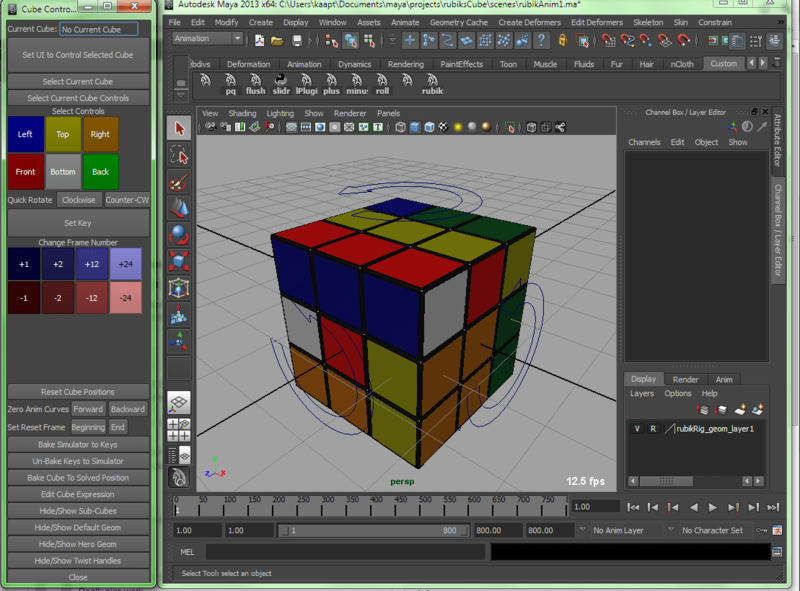 One of the best animation rigs I have in my toolbox is a really good rig for animating the Rubik’s Cube. For various math reasons, it’s a very tough object to animate. This rig is easy to animate with, thought, and has a rudimentary UI that makes using the powerful features easy. The default geometry is has full-face UVs, so you can just attach a texture to each color-face, and get a nifty cube/puzzle effect. The default geometry is easily replaceable with your own geometry, so you can insert your own wild designs instead of just the traditional shapes. Because you and I are animation fans, not Rubik’s Cube masters, the scripts that control the rig also have utilities to animate the rig towards a “solved” position. You can animated the twists to your heart’s content, then let the scripts use your twists to end up at a “solved” cube. I’ve updated it to use some new features of the parent constraint. It shows off the results you can get by animating the offset transform and the rest position transform. I’m still working on getting the rig and its documentation organized. In the meantime I wanted to post a note so you don’t think I’ve disappeared forever. As always, I’m not affiliated with the owners of the Rubik’s Cube name and trade mark, which I believe to be owned by Seven Towns, Ltd.